It’s clearly apparent that fresh locally sourced food is in integral part of Suffolk life. Suffolk has a diverse and wonderful landscape and this is reflected through the delightful range of food produced in the region. Agriculture plays a major role in the counties employment, as well as arable farming, poultry and pig production provide big areas of activity. 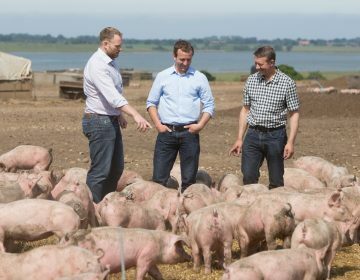 In fact 20% of the UK’s outdoor – reared pork is produced in Suffolk. The richness of the land is equalled by the waters of the North Sea and whilst fishing communities such as Lowestoft have reduced over the years, there are still in-shore fishermen providing quality daily line caught fish. Cod, Plaice, Sea Bass and Skate are just a few types that are landed on the Suffolk coast. Seasonal crab and mussels come from neighbouring Norfolk. Once the autumn leaves fall, the flat open countryside provides a great larder rich in game. Wild roe, fallow and red deer have little chance of hiding and with an abundance of local shooting syndicates there is never a shortage of teal, pheasant and partridge. Pigeon, hare and rabbit can be seen on menus all year round. Traditional family butchers with their own herd of Red Poll cattle. 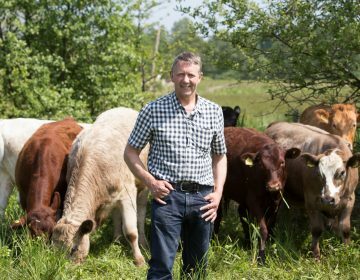 Jeremy Thickitt and family have been supplying us with the their finest beef since the day we arrived (August 2005). Suppliers to the White Horse of many speciality products, leading supplier of delicatessen products in the East Anglian region. One of the countries finest producers of free range pork and right on our door step. Owned and managed by the Butler family, pig welfare is at the heart of everything they do. 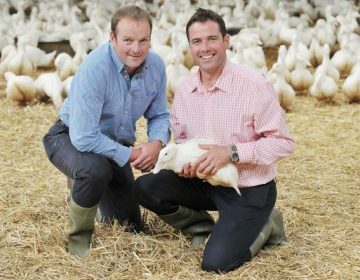 Reared on Red Tractor assured farms here in Suffolk the remarkable Gressingham Duck is a unique breed and is known for its superior taste and high percentage of breast meat. Danny offers us a very personal service. At the very early hours, six days a week days a week, Danny will be at the Lowestoft fish market selecting the finest freshest fish for his small group of customers. Foskers are based in Bucklesham just outside Ipswich and provide us with the fruit, salad and vegetables six days a week. Their connections with many local growers means we benefit hugely from the freshest locally grown produce. Local, national and speciality cheeses. Home to Southwold Bitter, Broadside and many more. A relatively new supplier to us that impressed us from the beginning with their knowledge and willingness. Extensive variety, excellent quality wines. Family run brewery offering good choice of real ale. Local brewery that uses ‘Sibton’ hops. The Sibton White Horse In Suffolk uses local suppliers wherever possible here is a list of our most used suppliers.